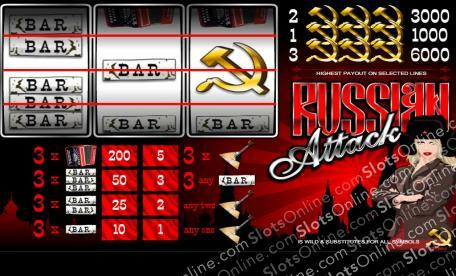 Celebrate the rich history of Russia in this classic 3 reel slots game. Click here to play! If you can spin in the right iconic Russian symbols, you could win a pretty substantial amount of money! As you might expect in a Russian themed game, the hammer and sickle symbol is key. Spin three of these gold icons across line 1 and you will bring in 1000 coins. Line two will bring in 3000 coins, and line 3 will bring in a top prize of 6000 coins! There are a few other symbols to help you amass your fortune, including the melancholic accordion. This instrument will get you 200 coins. Also watch out for the triple, double, and single BARS. These classic slots symbols will get you 50, 25, or 10 coins respectively if you spin three of them across one of the three paylines. Celebrate Russian culture in this amazing slots game and you might just see yourself walking away with pockets full of cash! The hammer and sickle symbol is a wild symbol and will replace all others to help you bring in more wins.